Boy, it's been a while since I reviewed anything that was not anime. Sorry about that. I've wanted to, just been so busy with everything. But enough of my excuses. Today I want to write a review for two movies that I watched recently, Ghidorah The Three-Headed Monster and Invasion of Astro-Monster (also known as Godzilla vs. Monster Zero ). I'm going to review them both together because they really do go together. In fact, according to the dude on the commentary track, the two films even had overlapping shooting schedules. Both of these movies are part of the Godzilla series, with Ghidorah The Three-Headed Monster being the fifth Godzilla movie and Invasion of Astro-Monster being the sixth. Now, I'll admit that it's been a long, long time since I've seen the original Godzilla... but even so, I know Godzilla isn't supposed to have googly eyes! Yeah, they changed the Godzilla outfit! This one didn't look all cool and badass, it looked more goofy and comical. After listening to the commentary, I learned that the suit had actually gone through revisions on every film. And on these films, he was purposefully made to look more comical than monstrous. Why? Because these two films were meant to be more comical. They were meant to take the series in a new direction. And that explains why I kept thinking "what the hell is this?" all through the film. Though I must admit, after realizing that these movies were intended to by cheesy and outlandish, I enjoyed them more upon repeat views. How many times did I watch them, you ask? SIX TIMES! Yep, for each one I watched the US cut, the US cut with commentary, and the original Japanese cut. If your curious as why I say US and Japanese cuts rather than "dubbed" or "subtitled", it's because the US version isn't just a dubbed version of the Japanese film. The US version is actually cut differently. Usually it's minor things, but there are some re-arranging and dropping of scenes. The commentary dude on Ghidorah The Three-Headed Monster will actually point out all the major cuts which were done to the US version, which is kinda cool. The plot in Ghidorah The Three-Headed Monster involves a meteor crashing to earth and a princess who is targeted for assassination. How in the world do these two things go together, you ask? Well, the princess is somehow saved by an alien from either Mars or Venus (depending on which version you're watching) when her plane blows up. The princess, now with the alien consciousness inside her, now starts popping up around Japan, prophesying the danger of giant monsters. Okay, so basically Godzilla and Rodan both wake up and start going at it. And eventually Ghidorah breaks free from the crashed meteor and also starts stirring up a bunch of damage. So then a baby Mothra (in the form of a giant larva) uses it's telepathic abilities to communicate with Godzilla and Rodan in an attempt to get them to put aside their differences and combine their power to defeat Ghidorah. And thanks to two little twin pshycic fairy girls who can understand Mothra, we get to hear their translation of the conversation between the three giant monsters. Now see, at this point if you were taking this movie seriously, you'd think it was completely absurd. But if you realize it's supposed to be insane, then it's actually kind of funny. Anyway, while all that is going on, we still have some assassins who are trying to figure out if this prophet girl is the princess that they're supposed to be trying to kill. And if you think that sounds silly, the plot of the next film, Invasion of Astro-Monster , is even more outlandish. Astronauts are on their way to the newly discovered Planet X, and when they get there they discover it is inhabited by humanoid aliens. These aliens act all nice and everything, so you know their evil. But of course the people in the film don't know that yet. So the aliens want Earth's permission to take Godzilla and Rodan from Earth and bring them to Planet X so they can defeat Monster Zero, a giant monster that is destroying their planet. And in exchange, the aliens are willing to give Earth the secret to curing any illness. Hm, sounds like a good trade to me. And then the deception comes, which presents a really, really big plot hole. Okay, so it turns out the aliens have already been on earth, and as soon as they get permission to take the monsters, their space saucers user their beams to extract the monsters from their slumber... and then the aliens threaten to use them to destroy the world unless they submit to being ruled. And thus the plot whole... why would the aliens spend half the movie pretending to be nice and making up stories when they were already on Earth the entire time AND had the power awaken and control the monsters? But I digress... and I think you get the idea. If you watch these realizing ahead of time that they're not meant to be taken seriously in the least, then yeah, they're enjoyable. Each on has a commentary on the US cut. These commentaries are done by super Godzilla fans (David Kalat on Ghidorah The Three-Headed Monster and Stuart Galbraith IV on Invasion of Astro-Monster ). They provide some interesting information, but I think it would have been really nice to have had more than one fan per commentary. Those things always seem to be more interesting with multiple people. But as it is, these are some good, solid releases. 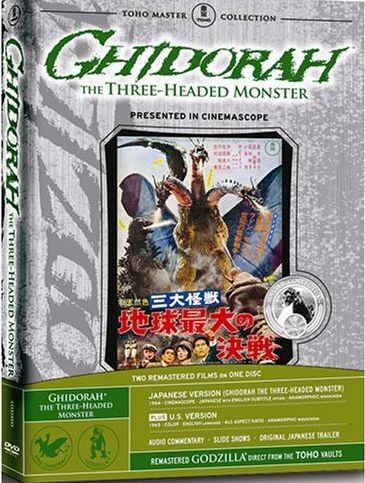 Ghidorah the Three-Headed Monster & Invasion of Astro-Monster were both released on June 5, 2007 by Classic Media.